Our understanding of G protein-coupled receptors (GPCRs) has been greatly aided by their relative tractability in terms of pharmacological targeting. These receptors are fairly easy to express in cells and their signaling pathways are amenable to high throughput screening (HTS) technologies. GPCRs couple to a trimeric G-protein structure composed of an alpha subunit and a beta/gamma subunit. The alpha subunit dissociates from beta/gamma upon stimulation of the GPCR and the duration of the alpha subunit signaling is determined by its intrinsic GTPase activity. This GTPase activity can be modulated by regulator of G-protein signaling (RGS) proteins. In terms of GPCR signaling the vast majority of attention has been paid to alpha subunits and part of the reason for this is the availability of molecules (e.g. pertussis and cholera toxins) that target those subunits. Despite this, it is well known that beta/gamma subunits are also capable of generating signaling as these little proteins are known to activate phospholipase C (PLC), PI3Kinase (PI3K) and G-protein receptor kinases (GRKs). Additionally, beta/gamma subunits activate G-protein coupled inwardly rectifying potassium channels (GiRKs) and inhibit certain types of voltage-gated calcium channels (VGCaC). While these signaling mechanisms for beta/gamma are well known, we know relatively little about the physiology of these processes in vivo. This is because we do not have tools to probe the function of beta/gamma pharmacologically. At least not until 2006. Bonacci et al., Differential targeting of Gbeta/gamma-subunit signaling with small molecules, Science (2006) [free at Science], was the first paper to describe small molecules that target beta/gamma subunits. The first step in discovering these small molecules involved describing a modulatory binding site for beta/gamma function. The authors used phage display of beta/gamma subunits to screen for peptides that bound to these subunits. They discovered a small peptide, SIGK, that bound to a “hotspot” in beta/gamma. They then used this hotspot to screen several thousand molecules computationally for potential binding within this region. They came out of this “virtual screen” with a list of 85 compounds that could then be tested for interference with SIGK binding to beta/gamma. Of these 85 compounds, they found 9 with apparent binding affinity between 0.1 and 60 uM. They then focused on these compounds as potential modulators of beta/gamma signaling. After doing a whole bunch of cutting-edge papers for the class its time to go back in time a bit (like 1998 is ancient but anyways) and do an oldie-but-goodie. This particular paper, “Effector Pathway-Dependent Relative Efficacy at Serotonin Type 2A and 2C Receptors: Evidence for Agonist-Directed Trafficking of Receptor Stimulus”, Berg et al., 1998 Molecular Pharmacology (Free at Mol Pharm) isn’t really a citation classic (with 278 citations according to google scholar), yet, it marks a very significant moment in GPCR pharmacology. I like this paper for two reasons: 1) It moved a major, emerging pharmacology theoretical framework forward toward experimental discovery and 2) I am very fond of the first and last authors. First to my fondness for the first and last authors, Kelly Berg and Bill Clarke. Bill and Kelly are professors in the Department of Pharmacology at The University of Texas Health Science Center at San Antonio (UTHSCSA). It so happens that I did my PhD in that very department (I started there in 1998). The very first class I took was Bill Clarke’s Principles of Pharmacology course. When I joined the department I was quite sure I wanted to be a pharmacologist but this course drove that point home for me in ways that are difficult to describe. The course was mainly taught by Bill and Kelly (who happen to be married) with Bill doing most of the teaching on basic principles and Kelly doing the teaching on molecular signaling through GPCRs. While I learned an enormous amount about basic pharmacological principles and the ins-and-outs of GPCR signaling in the class my main memories are of the passion for teaching and graduate education that they both passed on to all of us throughout the semester. I like to think that my teaching style came mostly from the two of them and while I am sure I have not yet lived up to their level of excellence, their example consistently gives me a goal to shoot for. In this class I like to use this paper to transition from screening technologies back to pharmacological principles largely because it reminds me to try to live up to what BIll and Kelly imparted to me through their course. 1) We obtain information about our environment through touch (among other things) but in certain conditions touch can become painful. We call this allodynia. The problem is we don’t know how this happens (but we have some good ideas — more on this later) and, ostensibly, identifying ion channels involved in mechanosensation would go a long way toward helping us understand this. 2) Certain types of mechanical inputs are painful (e.g. pinch or pin-prick) and these types of input become even more painful after injury. We call this hyperalgesia and, again, we have some good ideas of the processes that underlie this hyperalgesia but, ultimately, without knowledge of the initial transducer of mechanical inputs, it is hard to understand this fully. 3) Time for the most obvious reason, we just flat out don’t know how we feel mechanical stimulation. There are hundreds (or thousands, depending how you think about it) of papers out there on this but, to date, no one has clearly identified a mechanically-gated channel expressed by vertebrate sensory neurons. Until now. There were all types of rumors flying around about this at IASP. This is not unusual, however, as I have heard similar rumors at SfN and IASP meetings in the past. On Sept 2, a paper was published in Science from the Patapoutian lab at Scripps, La Jolla, that may open the flood gates in terms of describing how mechanical stimulation is transduced into signals that can be transmitted to the CNS. Today is our last paper on high throughput screening (HTS) techniques. We’re back to discovering drugs on this one but the premise is quite different for this particular screen. Whereas other papers we’ve done so far have involved finding novel drugs for known targets or identifying drugs that produce novel behavioral phenotypes, this paper is about finding novel drugs for enzyme targets that are not fully characterized. The paper is: “Identification of selective inhibitors of uncharacterized enzymes by high-throughput screening with fluorescent activity-based probes”, Bachovchin et al., 2009, Nature Biotechnology [PMC]. The idea is simple. Drugs work because they have an action at a molecular target. However, most drugs have side effects and we don’t always know why. Moreover, while we often presume that drugs work because they hit a particular target, this may not actually be true. There are generally several drugs of a particular class but one particular drug may be better for treating a disease. This could be explained by a number of factors and one potential possibility is that a given drug has a mix of activities that is a perfect fit for a particular disorder. The problem is that we don’t necessarily know what that polypharmacological mix is. If there was a computation model that could help us predict appropriate polypharmacologies and off-target hits at the same time we could potentially make large leaps forward in terms of drug development. The creation of target-specific ‘magic bullets’ has been a therapeutic goal since Ehrlich, and a pragmatic criterion in drug design for 30 years. Still, several lines of evidence suggest that drugs may have many physiological targets. Psychiatric medications, for instance, notoriously act through multiple molecular targets, and this ‘polypharmacology’ is probably therapeutically essential. Recent kinase drugs, such as Gleevec and Sutent, although perhaps designed for specificity, modulate several targets, and these ‘off-target’ activities may also be essential for efficacy. Conversely, anti-Parkinsonian drugs such as Permax and Dostinex activate not only dopamine receptors but also 5-HT2B serotonin receptors, thereby causing valvular heart disease and severely restricting their use. Drug polypharmacology has inspired efforts to predict and characterize drug–target associations. Several groups have used phenotypic and chemical similarities among molecules to identify those with multiple targets, and early drug candidates are screened against molecular target panels. To predict new targets for established drugs, a previous group looked for side-effects shared between two molecules, whereas another group linked targets by drugs that bind to more than one of them. 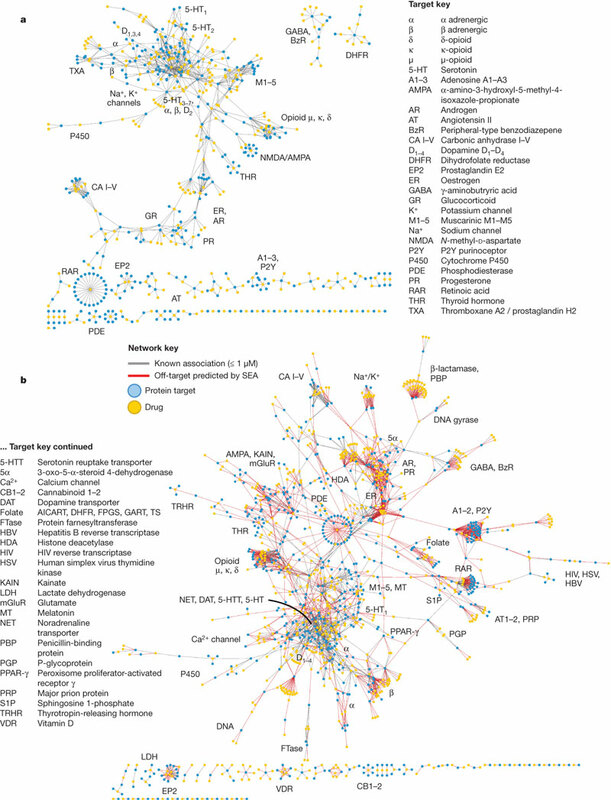 Indeed, using easily accessible associations, one can map 332 targets by the 290 drugs that bind to at least two of them, resulting in a network with 972 connections (Fig. 1a, below). It seemed interesting to calculate a related map that predicts new off-target effects. So what does this network look like? … at least according to my preset standard. I am now on Derek Lowe’s blogroll. Now that’s an honor! It also explains the considerable uptick in traffic around here. Somewhat cryptic reviews, any advice? We just got the referee and editor comments back on a paper we’ve been trying to get out for some time now. We first aimed high with a glamor mag and got some very encouraging reviews back from the editor but they were ultimately asking us to do far more than we can reasonably do (essentially asking us for experiments that would require us to develop a collaboration because we have no expertise in the type of very technically challenging and error-prone experiments they asked for) so we decided to shoot a tad lower and go for a very nice but non-glamour mag journal. We just got revision comments back from that review and I’m a tad confused by the comments from the editor. We had the standard 2 referee report. 1 referee is clearly on our side, in fact, she said “now acceptable for publication” in the review and also noted that we had appeased the comments of both referees. I was pretty happy about that. The other reviewer didn’t seem so happy and has asked us to do yet more experiments including several that they did not ask for the first time around (this frustrates me to no end, if you didn’t think of it the first time then don’t ask for it the second time). If we did all the experiments suggested by the reviewer we would end up with about 15 multi panel figures. This is obviously excessive. I should qualify that all the experiments suggested are very interesting and we would like to do them but at some point you have to consider that a paper can only be so long and can only fry so many fish. The interesting thing was the comment from the reviewing editor. They state right up front that the manuscript is potentially acceptable for publication and that they want to see a revised manuscript soon but they use the words “major revisions”. They also say that they are going to carefully review the manuscript and the response to the reviewers suggesting that they are not going to send it back to the referees (one clearly said accept anyway). The language is a bit cryptic so while I don’t think they are going to send it back to the referee that we have not fully convinced I cannot be 100% certain. The language of the editors really suggests to me that they would like to see the paper in the journal. We would be very happy to have this manuscript published in this journal so we don’t want to blow the opportunity by taking anything for granted. If we do all that the non-convinced reviewer has asked us to do we have 4-6 months of work ahead of us before we can get a revision in. This thought makes me sick to my stomach because we have advanced this work significantly into another area and we are almost ready to get that paper submitted too but it has to wait on this one. On the other hand, we can do a completely different experiment, which the reviewer has not asked for, that would very strongly support our contention but through a negative rather than positive result. That experiment would take less than a week. I am strongly inclined to do the fast experiment and make considerable text revisions and get this puppy back in. It does seem that the editors are on our side and a quick turn-around would hopefully catch them while they are still feeling good about what we have done. So, dear reader, what do you think? Am I off my rocker or does this sound like a reasonable path to acceptance?